The traditional capitalist imperatives of finance and automation are giving way to a model in which firms compete primarily for human talent. The corporations that are best placed to benefit from what the World Economic Forum has dubbed “ the Fourth Industrial Revolution ” - in which technology’s ability to enable human capital becomes the dominant market force - are those that maximize empathy. But where to start? For empathy to have lasting impact, companies must understand that it’s not a “soft skill”, but an urgently needed quality, and one that can contribute to commercial potential. Few of us would now question the importance of job culture, but this realisation is being driven home in increasingly empathetic fashion by millennials. Studies shown that 71% of millennials want their colleagues to be like a “second family”, and 75% feel that the organisation should mentor and nurture their talent. What they are demanding is a different kind of working experience: they are looking for connections; they want their voices — and their workplace requirements — to be heard. Silicon Valley has excelled at this. Alphabet’s childcare benefits, Hootsuite’s on-the-job napping policy , and LinkedIn’s reading breaks are acts of empathic recognition for an enlightened workforce that realises that job satisfaction goes beyond money. In the words of Tania Missad, director of global brand insights at Mattel, “Millennials are driven by social justice and attracted to brands with purpose and values.” Mattel’s latest Barbie launch was born of the attempt to make their doll fit into this category. It’s not just the perks. Millennials are vocal about wanting to work in a creative environment: 78% admit they are influenced by a company’s reputation for innovation. Once again, Silicon Valley is the benchmark. Six times as many patents are filed in California than in the whole of the UK. The statistics point to a positive relationship between corporate empathic cultures and ability to innovate. 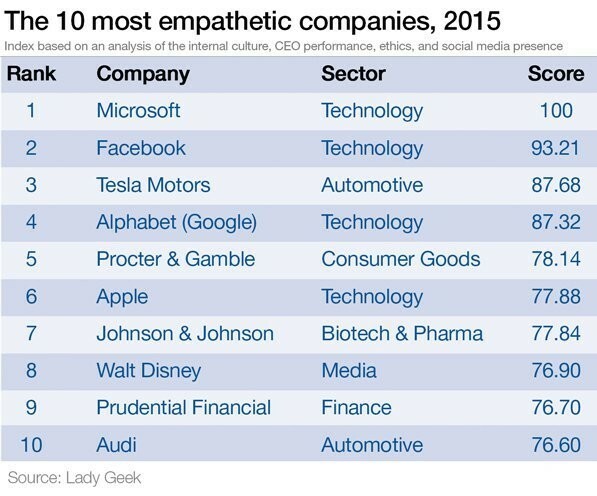 Four out of the top five most empathic companies spent more than $1billion on R&D in 2015 . Innovation is crucial to getting the best talent knocking on your door and, perhaps even more importantly, it sparks off a virtuous circle by which you will attract the next wave of innovators. We demand humanity from the brands we shop from - often this humanity comes in the form of a single business icon. Who better to speak for the company than a CEO or founder: somebody whose connection to the company and its vision cannot be called into question. This is the polar opposite of the celebrity spokesperson. Elon Musk oozes the kind of determination which will convince skeptics to invest in his greenfield projects. Without the man who says he will “ never and I mean never” give up, would we have quite so much faith in Tesla motors? The five most empathic companies on the Empathy Index score an average 94% CEO approval rating on Glassdoor , whose ratings include input from past and present company employees. Meanwhile the bottom five in the Index score a lowly 27%. While our instincts might be to wait until a scandal emerges and then make the minimum possible disclosure, the best companies harness the disinfecting power of sunlight before any rot sets in. The traditional models of corporate secrecy can actually harm reputations by providing the perfect environment for scandal to fester. Corporations need to resist the natural instinct which to cover up and deflect attention from uncomfortable truths. Instead, leading companies are finding ways to publicly confront their problems as the first step towards dealing with the underlying issue. Alphabet led the equality agenda by publishing its own diversity figures - however bad they seemed, the company was quickly perceived as a pioneer. What may have been an embarrassing secret was transformed into the kernel of a credible campaign for equality. Whole Foods, which ranked within the top 5 in our Empathy Index, is known for its transparency in product labelling. Its CEO believes that the customer “can handle the truth”, and that customers will reward this trust. At the other extreme, VW USA’s attempt to circumvent environmental regulations tarnished the reputation of their industry. Customers want to know where you came from and what drives your passion. It matters that a big multinational once operated out of the founder’s parents’ garage. The company’s origin story helps us understand what the company was set up to do. They help us see a corporation as a human endeavour and not just another machine. Some of the best back-stories combine the origin of the company with an explicitly ethical purpose. The TOMS Shoes company was not just founded to sell shoes, but to provide comfortable footwear to parts of the world where shoes are an unaffordable luxury. And if that weren’t enough, and founder Blake Mycoskie evidently thought it wasn’t, a sabbatical six years later led to the birth of TOMS Coffee, whereby for each bag of coffee sold, the company would provide a week’s worth of clean water to a person in need. Its policy of one pair of shoes given for every pair bought has given its business a distinctive ethical dimension. Social media has made brands the subject of public forums where they can be named and shamed, and that has caused many companies to distrust them, failing to recognise the positives they offer. Rather than the likes of Twitter as a threat to be managed by marketing departments, companies need to see that social media offer an opportunity to show their human face. Social media provides a space for dialogue, a way to deliver messages with humanity and authenticity. They are a platform for empathy. Those that have realised this are reaping the benefits, particularly those that understand that empathy needs to be expressed at all levels of the company and not just in HR department memos. Recognition of the importance of social media in creating increased levels of dialogue with customers is reflected in the fact that 80% of the CEOs of the world’s largest 50 companies now personally engaged on their company’s social media account. Displays of extreme emotion, whether from fan or foe, are hard for customer service departments. They take us off script, because they fall outside the standard deviation. The temptation is to ignore them ( 70% of customer complaints directed at businesses on Twitter are simply ignored ) or give a robotic response - which can inflame anger. Instead of treating customer complaints as a threat, look upon these extremes as a source of emotional insight for your company. Any form of feedback (even an angry complaint) is a gift. Companies must find ways to listen and learn from feedback, however uncomfortable they make use feel. Companies like HSBC have understood this, checking back with customers 24 hours after receipt of complaints to make sure they are being dealt with, thereby seeking further feedback and perpetuating the process of dialogue. Amazon employees, meanwhile, can email their CEO directly if they are experiencing problems with the company’s internal culture. Even Ryanair, a company infamous for sayings like “what part of ´no refund´ don’t you understand?”, and “we don’t want to hear your sob stories”, have finally began to emulate their more empathic betters, with its “Always Getting Better” programme. Given that social media provide a public window into the innermost workings of organisations, our “private space” is shrinking. Expect the world to take an interest in your organisation’s choice of international banking and manufacturing partners. Their problems suddenly become your problems, and your problems have the potential to go global more quickly than they can possibly be contained. Companies and brands need an ethical dimension – somebody on the board who asks “should we?” instead of just “can we?”. VW ( who dropped from 27th in our first Index to 95th in the latest wave ) shows even a secret, buried in layers of obfuscated, embedded software, can be discovered. In today’s environment, no secret can hide from an interested public. Empathy is a hard skill, but boosting it has the potential to reap disproportionately grand results. Empathy must be prioritised and valued through the whole organization not just relegated to one department. It must eventually be grown in all customer and employee relationships, selected for at all levels of management. That’s the end game, but in the shorter term it’s important to get things started. Empathy can be demonstrated in the form of easy to implement nudges. Change small things, and the bigger things can follow more quickly. You might not be able to appoint a Chief Empathy Officer just yet, but you can change your attitude to complaints or begin telling your company’s story. Belinda Parmar OBE is a Young Global Leader for the World Economic Forum and is the creator of the world’s first global empathy index .